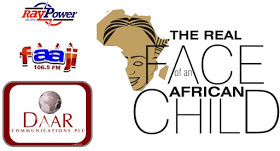 Africa’s number one independent Tv station , Africa Independent Television AIT, Africa’s number one radio station, Raypower International and Faaji fm with more than 33 offices across the length and breadth of the country, has stretched out its hand of fellowship to the hosting of the ‘’Real Face of African an Child’’ competition being organized by Hope Alive Concepts. This, according to sources close to us, was the result of a Memorandum of Understanding (MOU) signed between the organizers and the station’s top notch who showed a lot of interest, love and passion for the development of the African child. To this effect, the highly-acclaimed and multiple award-winning station founded by High Chief Raymond Dokpesi’s Daar Communications Group which also houses the African Independent Television (AIT), RayPower and Faaji FM, will join hands in the publicity campaign of the programme as well offer all its 37 offices as registrations outlets for budding talents. Unlike other reality pageants, the Real Face of an African Child is more of a talent hunt competition for kids between the ages of 5-13 years and seeks to offer educational rewards to the outstanding ones in form of scholarship alongside a brand new family car and cash prizes. It is strictly for children and especially for those who are good at dancing, singing, acrobatic display, cooking, baking, drawing, acting, modeling, martial arts, mimicking farm animals, joggling the ball and a host of others. After its formal introduction a few months back which attracted a deluge of interests by interested contestants, the opportunities are here now as the zonal audition dates have been released and set to commence in seven different cities across the country. Hope Alive Concepts, the organizers who believe that ‘’there is a star in every home’’, are therefore calling on interested parents to avail themselves of the opportunity and register their children and wards at any AIT, Raypower/Faaji FM station across the country or walk into any bank using the NIBSS E-bills pay. And what is N1,000 to the prizes at stake! The audition venues are Lagos (Island/Mainland), Warri, Enugu, Port Harcourt, Calabar, Abuja and Makurdi.